Mahindra Racing will incorporate the design expertise of Pininferina and the digital technology prowess of Tech Mahindra in the development of its M5Electro race car, for for Season 5 of the Formula E Championship. Mahindra Racing, the Formula E Team owned by the India-based Mahindra Group, today announced the formation of a strategic partnership, with Pininfarina and Tech Mahindra. While Tech Mahindra is the technology arm of the company, Pininfarina, also owned by Tech Mahindra, is it's global design brand. The company says that this new partnership will give the Mahindra Racing Formula E Team access to both Pininfarina's iconic design expertise and Tech Mahindra's digital technology prowess. Right now the team is getting ready for the Season 5 of the Formula E Championship, which will commence in December 2018. Commenting on the new partnership, Ruzbeh Irani, President (Group Communications & Ethics) & Chief Brand Officer, Mahindra Group, said, "The Mahindra Racing Formula E team has had a very successful start to Season 4 leading both the Teams' and Drivers' Championships after the first three races. We are now delighted to welcome Pininfarina and Tech Mahindra as partners, as we gear up to meet the challenges of this new season and beyond. Combining their design, technology and digital skills will significantly augment Mahindra Racing's existing capabilities and raise the bar as far as our performance is concerned. This strategic partnership is also aligned to Mahindra's vision of FUTURise, a creative expression of how we are driving growth through world-class innovation in all our businesses." The ABB FIA Formula E Championship is an electric street racing series and the world's first fully-electric international single-seater category in motorsport. Mahindra Racing is currently developing the M5Electro race car for the upcoming season, and with Pininfarina as its sponsor, the team will be able to incorporate the Italian design house's iconic design and technology expertise to enhance the car's performance. 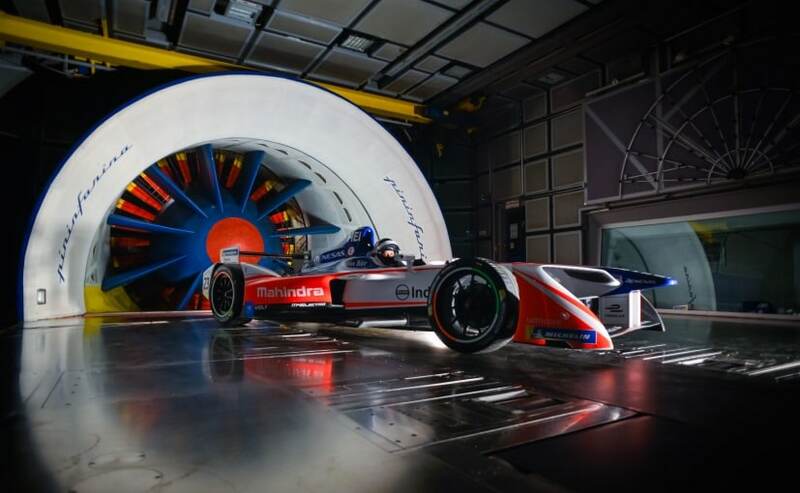 Under the new partnership, Mahindra Racing will also have access to Pininfarina's wind tunnel testing facilities in Italy which will help the team enhance the aerodynamic efficiency of its race car. Commenting on their testing facility, Silvio Pietro Angori, CEO, Pininfarina said, "We own one of the most advanced Wind Tunnel's in the world, a centre of excellence for research and development in the aerodynamics and aero-acoustics field since 1972. Over the years many aerodynamic tests have been carried out in our Wind Tunnel for passenger cars, for Formula 1, for motorcycling and for the sports equipment of world-class athletes." Mahindra says that this new partnership will also allow the brands to work on other areas of design and technology, including Computational Fluid Dynamics (CFD) work. This will help Mahindra with its 'Race to Road' strategy where the company plans to use the application of learnings from the race track into the development of new electric road vehicles, in due course. As of now, Mahindra has claimed that by 2019 the company will launch 2 new electric cars in India.